AFC Bournemouth Under-21s, with the help of a returning Junior Stanislas, put in a dominant display to knock Eastleigh out of the Hampshire Senior Cup on Tuesday. The Cherries got off to a flying start, as some neat interplay between Marc Pugh, Frank Vincent, and Tyrone Mings resulted in the ball ending up at the feet of Alex Dobre. The number 9 had no problems tapping into an empty net to put Bournemouth 1-0 up inside five minutes. James Constable had a vague sight at goal as he glanced a header just wide, but the home side continued to look more likely in the opening 20 minutes, Pugh coming close with a strike smashed against the crossbar following some good combination play with Keelan O’Connell and Vincent. The pressure paid dividends 21 minutes in, Marc Pugh capitalising on some neat linkup passes between Junior Stanislas and Dobre down the right. Pugh received the ball in acres of space in the centre of the box, taking his time to slam home with his right foot for 2-0. Pugh almost had a second moments later, the winger again benefitting from Stanislas’ and Dobre’s build-up play. Pugh’s tap-in, not dissimilar to his first goal, was flagged up for offside. The front-three of Dobre, Pugh and Stanislas combined again on the half-hour mark, with Stanislas’ run into the box being picked out by Pugh, the former finding the net with a powerful high finish to put the Cherries 3-0 up. Vincent had a couple of chances to put his name on the scoresheet, dragging a left-footed shot just wide, before getting another one on target but into Ross Flitney’s midriff. Alex Dobre cut inside and saw another shot curled onto the crossbar to wrap up the first-half’s action. Carl Fletcher’s side began the second half much like they started the first, Dobre turning in the box and drilling a low-strike into the bottom right corner with his right foot for 4-0. A hat-trick was beckoning for Dobre on the 57th minute. Awarded a penalty for being pulled down in the box, Dobre’s low penalty to the bottom left of the goal was saved well by Flitney. After a brief dip in the Cherries’ attacking performance, Vincent popped up on the edge of the 18-yard box to curl one inside the far post past a wrong-footed Eastleigh goalkeeper. Bournemouth’s clean sheet was well taken from them when Lewis Waterfield, on as a substitute for Eastleigh, slammed a shot into the top right corner out of Mark Travers’ reach for a consolation goal. Eastleigh’s sails were deflated by an instant response from the Cherries, Vincent again finding himself inside the box and poking into the bottom right corner for 6-1 with just over 15 minutes remaining. Six became seven on the 85 minute mark, Seaman threading a ball through to Pugh inside the box, the latter placing the ball through the keeper's legs with his right foot for 7-1. Keelan O'Connell rounded up the scoring, receiving a well-weighted pass from Pugh before shifting onto his right foot and burying into the bottom left corner for 8-1. Fans were eager to see Junior Stanislas return from injury tonight, and the winger didn’t disappoint. During his hour of play, Stanislas consistently linked up well deep in the final third with Marc Pugh and Alex Dobre and was rewarded with a fine goal of his own. 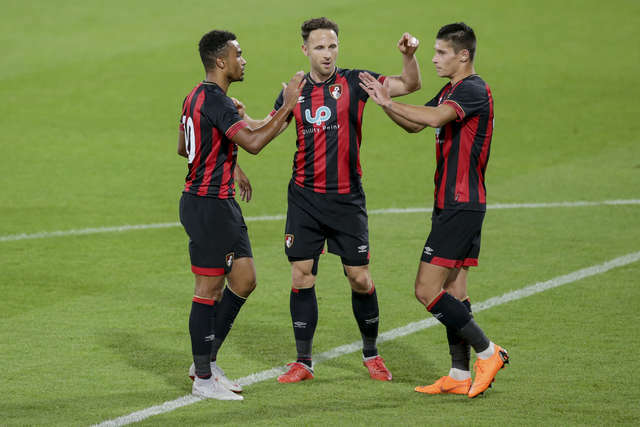 With the fine form of Ryan Fraser and Josh King, getting into the Cherries first team will be no small feat for Stanislas, but performances like the one he put in tonight will give Eddie Howe a good selection headache. With the help of senior figures like Stanislas, Pugh, Mings, and Simpsons, the U21s looked solid throughout the game, limiting Eastleigh to few clear cut chances. Dobre stood out in the front free, showing great ball control and linking up well with Pugh and Stanislas. The Romanian trained with the first team in La Manga during pre-season. He didn’t lack confidence to continue shooting at goal even after his penalty miss. Late on in the game, Vincent aged like a fine wine with two clinical finishes to make sure of the result for the Cherries.